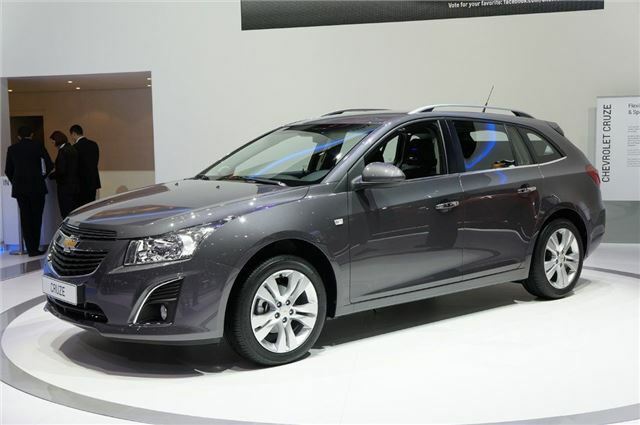 Chevrolet has revealed its new Cruze Station Wagon at the 2012 Geneva Motor Show. Following the launch of the Cruze hatchback last year, the estate model has a maximum 1500 litres of boot space with the rear seats folded down - the same as a Ford Focus Estate. It will go on sale later in June 2012 with prices expected to start at around £13,000. The Cruze Station Wagon will also come with a new 1.7-litre VCDi diesel engine with 130bhp. It's fitted with an automatic engine start/stop system to maximise efficiency and as a result emits just 119g/km of CO2. At 4,678mm, the Station Wagon is slightly longer than the hatchback (4,510 mm) and saloon (4,597 mm) models while standard boot space with the rear seats in place (and up to the window line) is 500 litres. All models come with roof rails as standard. Meanwhile, all 2012 Cruze models get exterior and interior styling changes including a new front end design with modified headlights and fog lamps plus new wheel styles. Inside there are improvements to the centre console and a wider choice of seat finishes.